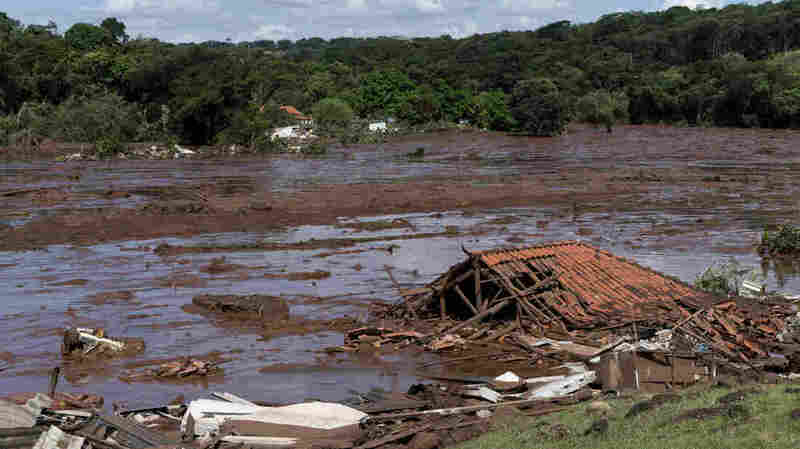 Dozens Dead, Hundreds Missing After Brazilian Mining Company's Dam Collapses Some 300 people are still reported missing. In 2015, 19 people were killed when another Brazilian dam partly administered by the same company collapsed. A home lies in ruins after a dam collapsed near Brumadinho, Brazil, on Friday. The death toll from the collapse of a dam near the southeast Brazilian city of Belo Horizonte rose to 58 on Sunday as searchers laboring in deep mud uncovered more bodies. Several hundred people are still reported missing. Fire officials at one point estimated 300 people are still missing, the Associated Press reports. Authorities renewed search and rescue efforts on Sunday, after the operation was briefly halted over fears of a second dam failure. The AP says that by afternoon, the second dam was no longer under threat, according to civil engineers. The dam is owned by the mining giant Vale, which also operates a nearby iron ore mine. Vale's CEO, Fábio Schvartsman, said roughly 300 workers were on site at the time of the rupture. "Someone is definitely at fault," Brazil's Attorney General Raquel Dodge said, while promising to investigate, according to the AP.